Key Note Speakers: Mother Iliana, Christ the Bridegroom Monastery, Burton, Ohio; Father Alex Wroblicky, Eparchy of St Josaphat in Parma, OH. Additional Speakers: Seminarians Michael Kunitz and Kyprian Wojciechowski, Byzantine Catholic Seminary of Saints Cyril and Methodius, Pittsburgh, PA. Location: Saint Anne’s Ukrainian Catholic Church, 4310 Kirk Rd, Youngstown, Ohio 44511. RSVP: by Sunday, March 10th. Optional Saturday Morning Social Service Project: Service Project to be performed from 8:30am to 11:30am on Saturday, March 23rd at the Society of Saint Vincent DePaul, 252 E Wood Street. Youngstown, OH 44503. Service project itinerary will be provided closer to the Retreat Day. 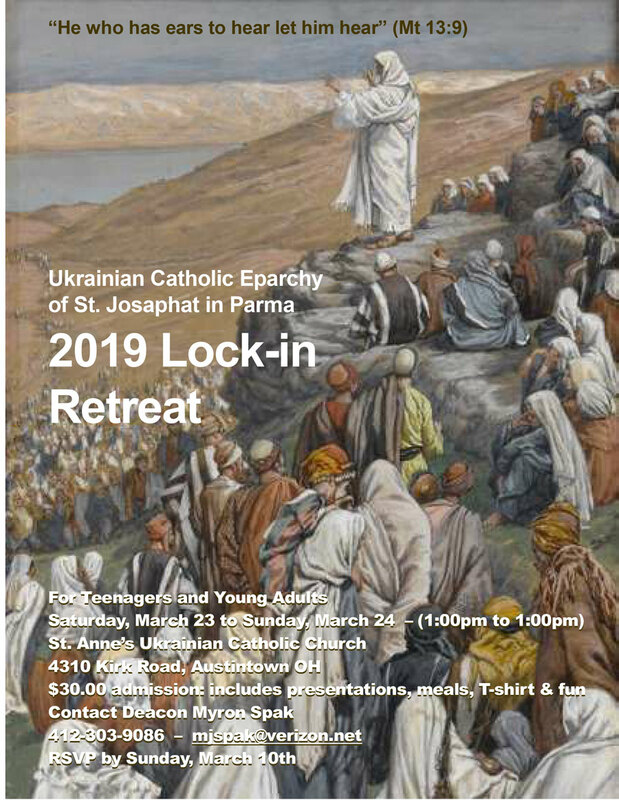 Let us pray so that the 2019 Lock-in Retreat will be the best possible experience for youth who may be looking for an impactful and meaningful retreat experience during the Great Fast.